In the late 1950s the US Army was searching for a more modern tank to form its battle fleet and to replace the M48 series. They tried a new line of tanks with the T95 but this tank never seemed to provide a satisfactory alternative, so an updated version of the M48 tank was then considered. There were three primary things the Army sought for this tank: the AVDS-1790 diesel engine to reduce fire risks and increase range; the new British 105mm L7A1 main gun to replace the 90mm series weapons; and the use of siliceous core armor plate on the glacis and parts of the turret. While the first two items were relatively easy to achieve, the latter one ran into cost and production issues and was dropped. While a new “long nose” turret from the T95 program was preferred, the original turret adopted to field the new tank, now dubbed M60, was a modified version of the M48 series turret with a bubble in the back to permit use of the new gun and larger ammunition. The first M60 series tanks were delivered in 1960 but had problems. The new M85 machine gun did not work properly so the first 300 tanks were fitted with an external mount on the cupola and an M2HB machine gun on a flexible mount. All had the lightweight aluminum wheels which the Army had wanted to reduce unsprung weight. After 2,205 M60 tanks were delivered, the first M60A1 tanks with the “long nose” turrets began coming off the production line in 1962. Also fitted to the M60A1 were six shock absorbers - the M60 had not used them and tended to pitch badly (these were apparently retrofitted). The M60A1 had thicker armor protection than the M60 (which is why they were soon reclassified as Standard B and given to the reserves) but the first production lots were noted as having two shot traps under the front edges of the turret. This was corrected by thickening up the lower “cheeks” of the turret and the support for the upper turret race. 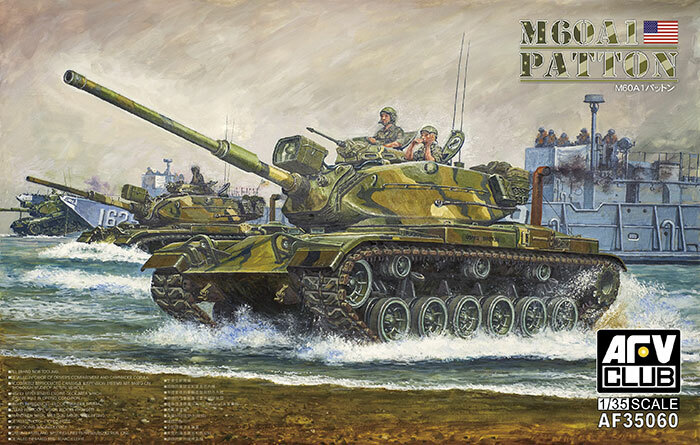 The M60A1 and its later version, the M60A3, remained in production for over 20 years and were constantly upgraded with new sights, electronics, air cleaners, and finally a switch back to M48 style steel road wheels. Note that basically all US Army tanks from the M26 to the M1 can use the same road wheels - as a point of fact, the ex-ranges M26A1 tank on display in front of the 3AD Headquarters in Frankfurt in 1988 had been restored with aluminum M60 road wheels. The first 1/35 scale M60A1 kit to be released was one from Tamiya in late 1970 – while a good kit for that time, it suffered from “motoritis” and a lack of precise scale proportions, bad tracks, and awful wheels with massive external caps to hold them in place. But this kit continued in production over the years and is still re-released from time to time, and was used for a new M60A3 kit in 1987 and an M60A1 RISE Passive tank with ERA in 1992. But they still use the same original hull and most of the original parts less the turret. Academy cloned the M60A1 kit early in its career and also later released the USMC M60A1 RISE Passive tank with ERA in Desert Storm trim. It was only slightly better than the original. In the early 1990s ESCI of all companies released a new kit of an M60A1 Blazer equipped tank in IDF service which also included most of the parts for a US M60A1 tank. At the time of its release it was both the best ESCI kit ever and the best M60A1 kit. It came with “link and length” tracks and was close to scale in its measurements. Last year AFV Club finally began to release its highly anticipated M60 series which they had previewed at AMPS 2013 in Atlanta. In brief, the wait has been worth it as it is a truly spectacular kit. While they call it the “M60A1 Patton” this tank never received a formal name in US service. What it provides is the mid-production M60A1 with the thickened turret armor, a choice of either steel or aluminum road wheels, and a wealth of optional details. The engine deck access grilles are all separate parts, there is a choice of escape hatch, the main gun is provided complete, and black vinyl flexible covers are included for the mantlet and main gun sleeve. Probably the only negative comment is the fact that there is an overdone casting texture to the turret, hatches and hull but while not quite right I think most modelers will not worry about it very much. It is not as severe as the recent Revell Germany M48A2 kits as a comparison. The first seven steps cover the suspension, and while it only shows the aluminum road wheels being used you can swap them out for the cast steel ones; these even come with a separate “lip” ring for accuracy. Drivers also come with pre-molded clean-out holes. The entire engine deck is composed of no less than 34 parts with separate sections, lift rings and hinges; however there is no engine or interior detail (I suspect a companion Hobby Fan resin set will be offered!) The rear grilles are separate and even show casting numbers (as to all parts that require them). As it is the mid-production version of the tank, it comes with the original M48 style side-loading air cleaners. Each one consists of eight parts. There are also two different designs of rear deck telephone boxes that attach to the rear of the hull. There is also an option for either a grille section for the right rear engine access door or the wading stack and its fitting. The main gun either has a solid styrene mantlet fitted (A4) or the flexible black vinyl one (T2) with accordion sleeve (T5) and the searchlight mounts attached. The turret basket comes with a complete etched brass floor and back mesh set. The entire assembly is very petite and care must be taken during assembly to not break the styrene parts. The commander’s cupola comes with two shells - one solid, one clear - so you have a choice of either masking off the ports or simply using a preferred method to indicate clear parts (I prefer sections of old 35mm photo film header) instead. There is also a black vinyl cover (T4) for the commander’s machine gun. The searchlight also is a far cry from the older Tamiya ones and consists of 18 parts and a solid clear lens. A black vinyl power cable (T3) is provided for hookup. Five different finishing options are provided: Austrian Army (olive drab, 224 with unit markings); IDF, Sinai 1973 (sand, 817878 with turret markings); HQ50, 3-33 Armor 3rd US Armored Division 1977 (USAREUR scheme, black markings); B66, 4-69 Armor, 8th ID (tricolor scheme of sand, black and dark green with black stars and white markings); USMC (MERDC Winter Verdant scheme, black markings). For some reason all canvas is shown in white on the painting guides but is more of a field drab/khaki shade in real life. A nicely done decal sheet covers all of these variants. Overall this is one of the best things for armor modelers who like modern and US armor in a long time - kudos to AFV Club for this kit!